Rinse the asparagus spears. If the ends of the spears are tough, cut or snap them off. Line a roasting pan with foil and evenly distribute the asparagus on the pan. Drizzle with olive oil and rub the spears in a back and forth rolling motion so that they are evenly coated. 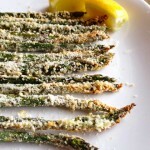 Next, sprinkle with Parmesan cheese, garlic powder, salt, pepper, and lemon juice and run evenly over the asparagus so that it is evenly distributed. Roast in oven for 10 to 15 minutes or until browned to your liking. Lesley likes to mix all her ingredients in a large bowl to ensure that the asparagus are evenly coated. Do you know how to prepare asparagus? It’s easy. Just wash and then snap or cut off the white ends of the stalk and they are ready to cook. Asparagus is very versatile and can be grilled (8-10 min), steamed (4-8 min), stir fried (3-7 min), boiled (2-5 min), or roasted (7-15 min). While putting this nutrition nugget together, I (Lesley) learned such an interesting fact that I could not resist telling you...Did you know that White Asparagus comes from the same plant as Green Asparagus? I had no idea. According to the California Asparagus Commission, when the spears emerge from the ground, the sunlight turns them green. In order to get white asparagus, farmers pile dirt on top of the stalks so that they grow underground. Pretty cool, huh?